Harman Kardon Omni+ speakers offer ‘true HD’ multi-room streaming | What Hi-Fi? 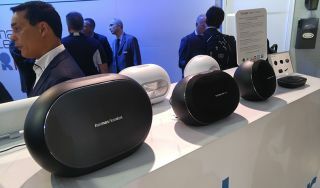 Harman Kardon has unveiled the second generation of its Omni multi-room speakers. The Omni+ range offers more speaker sizes than the 1st-gen Omni system, plus the promise of ‘true HD’ sound. There are three standalone speakers: the Omni 10+ (small), Omni 20+ (medium) and Omni 50+ (large). These are joined by the Omni Bar+, which is a soundbar and wireless subwoofer. Finally we have the Omni Adapt+, not a speaker but a networked box of connections for attaching old or third-party systems and speakers. By ‘true HD’, Harman Kardon is referring to hi-res audio up to 24-bit/192kHz (the original Omni range was capped at 24/96). All models offer Bluetooth, multi-room streaming, Spotify, Google Cast and 5GHz wi-fi support. Multiple Omni+ speakers can be combined to form a 2.1 or 5.1 surround system. The Omni 50+ is designed to be portable, with a built-in battery and IPX5 (splashproof) certification. The entire range, with matte black or white options, will be released in June 2016.